Mayor De Blasio addresses 400 Ethics Conference Participants. Credit: NYC Mayor’s Office. 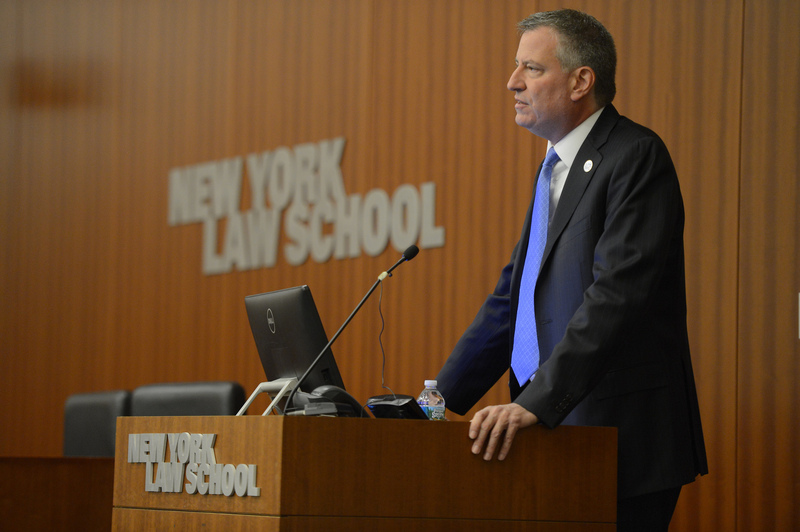 On Tuesday, May 20, 2014, the Center for New York City Law, at New York Law School hosted the Twentieth Annual Seminar on Ethics in New York City Government. The seminar was co-sponsored by the Conflicts of Interest Board and financially supported by the Department of Investigation. The five hour seminar was attended by over 400 participants, including many City government employees who were able to attend for free. Ross Sandler, Director of the Center for NYC Law, opened the seminar by introducing the COIB Commissioner Richard Briffault. Commissioner Briffault welcomed Mayor Bill de Blasio to present the keynote address. Mayor de Blasio’s participation this year continues the tradition of the City’s mayors delivering the keynote, which included Mayor Michael Bloomberg in every year of his administration and Mayor Rudolph Giuliani. Mayor de Blasio spoke about the importance of ethics in government and how those in public service need to always be mindful of ethical requirements and obligations. The Mayor focused on the importance of ethics in order to maintain the public’s faith in government. Mayor de Blasio said those in government have a dual job to not only do everyday work effectively and ethically, but to also dig deep to restore the public’s trust in government. Following the Mayor’s address, Anthony Crowell, Dean and President of New York Law School welcomed guests. Dean Crowell also is a member of the COIB. The opening session ended with awards presented by the COIB to Rose Gill Hearn, Chair of the NYC Campaign Finance Board and former Commissioner to the Department of Investigation, for promoting ethics and integrity in city government, and to former COIB member, Burton Lehman. Click on the link below for the full video of opening session, including Mayor de Blasio’s speech.